KVM (keyboard, video, mouse) mixed cable assemblies are components that allow users to control multiple PCs with a single device. This means that the user does not have to employ a separate keyboard, video and mouse for each computer. KVM mixed cable assemblies are connected to KVM switches. They simplify cable management by reducing the number of cables required. The conductors on KVM mixed cable assemblies are shielded by PVC jackets, and the connectors are gold or nickel plated. What are KVM mixed cable assemblies used for? 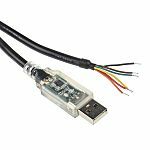 KVM mixed cable assemblies are used in industries with high-security applications and where the need for top resolution imaging is crucial. These cable assemblies are typically found in military and governmental industries, research labs and aeronautical environments. KVM mixed cable assemblies come in combinations of PS/2, VGA and RS232 configurations. Assemblies are available in various lengths. 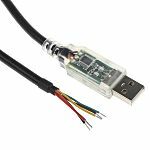 KVM mixed cable assemblies also have different voltage and current ratings, which must be compatible with the devices they will be connected to.